Dramatic chromolithography, 20” x 16” in loose gold painted frame. Rich color, dramatic Naval scene, important and historic event. This was likely printed to comemmorate the centennial of the famous victory. 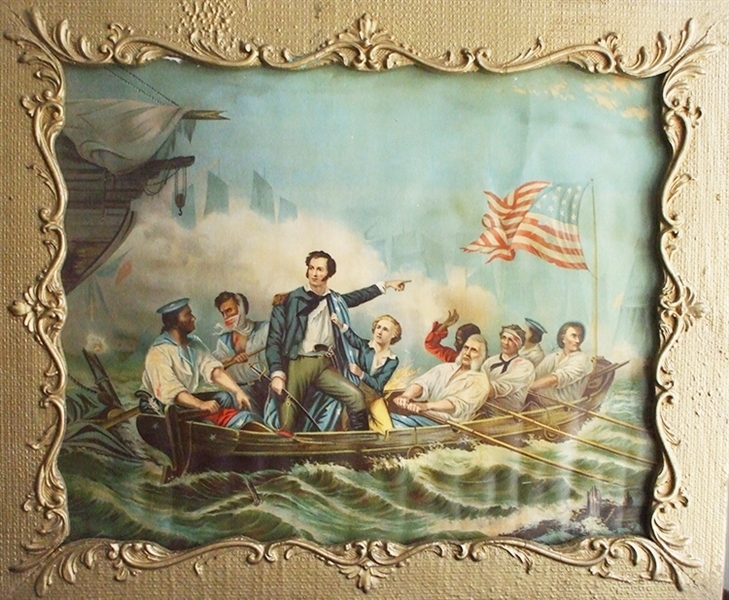 On September 10, 1813, the U.S. naval squadron on Lake Erie, commanded by 28-year-old Oliver Hazard Perry, defeated the British squadron off Put-in-Bay, near Sandusky, OH. The actions of this 9-vessel squadron were instrumental in defeating the British during the War of 1812 by giving control of Lake Erie to the Americans. As a result, Commodore Perry and his relief flagship, the U.S. Brig Niagara, were written into the young history of the United States.